My colleague Susan Stanfield and I collaborated on this project for Community Living B.C. with three groups of self advocates from all around the province. Susan and I have been working together (with Ernie) for more than 25 years! Whenever I am thinking of things to be grateful for, this long and quite amazing partnership is at the top of my list. We had so much fun with the three groups, and with Jule Hopkins, who is such a visionary. We’re pretty excited about the materials that C.L.B.C. has been producing in print and video and glad to be part of it. 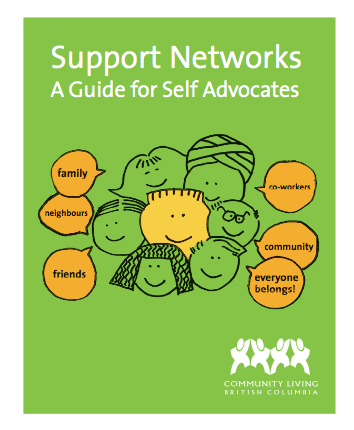 Right now we are working with other self advocates, and Shelley Nessman and Jim Reynolds, who is the manager of social enterprises at Spectrum, on a new booklet to do with vulnerabilities. But I was just thinking that I’m still really thrilled with this first booklet and am excited that they’re turning it into an animated film. We’ve been doing workshops around B.C. about the ideas in this booklet and will soon be getting ready to make a fall travel schedule. If you’re part of a self advocate group in some way, let us know by leaving a comment and we’ll try to figure out how to bring the workshop to you.